Making pancakes is surprisingly easy once you get the hang of it. My dad likes to point out that he can make them from scratch in the same time it would take you to mix up a batch from pancake mix. 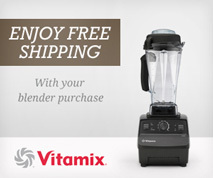 A Vitamix lets you grind the grains on the spot so the whole-grain flour is maximally fresh. You can also make whatever flour combination you want on the fly (sub in oats, buckwheat, corn, rice, quinoa, etc.) I hadn’t made pancakes in a while though so I’m keeping this batch simple with just wheat and oats. This is a standard buttermilk pancake recipe, a little extra deluxe by my standards because I used butter. Makes ~22 ~3.5″ pancakes, enough for ~4 servings. Pictured above is about half of the batch. I like to keep the wheat berries in the freezer so that they do not heat up as much when grinding. I also like to start preheating the pan on low heat while I’m mixing everything up, and then once the batter is ready I turn up the heat to medium/medium-low. Put the dry grains in the dry container if you have one (you can do this in the standard container, but over time it will scratch up the inside of the container, and you won’t get quite as fine of a flour). Blend on high for about a minute. (The Vitamix cookbook warns not to grind flour for longer than 2 minutes because you can generate too much heat and damage the machine.) Once it turns into flour it will be pushed up the sides with a hole in the middle where the blades are. To get a really fine flour I like to push the tops of the flour piles back into the center a few times with the tamper. Then add the remaining dry ingredients and blend on high for a few seconds, again pushing in the tops of the flour so that it circulates. Add the wet ingredients, and mix on variable speed 5 for a few seconds. 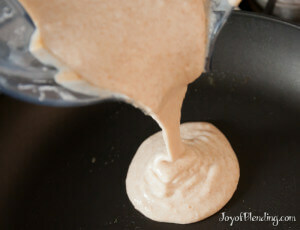 Use a spatula to scrape any remaining flour off the walls/corners and then blend for a few more seconds. 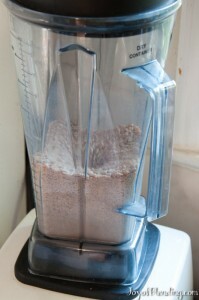 Ideally you don’t want to over-blend it at this step, although it’s not too critical. Stir it again with the spatula if necessary. Some small lumps are fine (small pea size or smaller), you just want to make sure there aren’t any large lumps of dry flour. Test the pan temperature by splashing on a few drops of water—it should sizzle and dance around. I usually set the burner to medium or medium-low. Put a little butter or oil on the pan and spread it with a spatula (unnecessary if you have a non-stick pan). Pour the batter in (I pour directly from the pitcher). If the batter is too thick to pour you can thin it out with some milk. Cook for 2–3 minutes per side, flipping with a spatula. If the pancakes aren’t browning in ~3 minutes, turn up the heat; if they are over-browning before the inside cooks, turn down the heat. If you have the luxury of an electric pan with temperature control set it to 375 F. If you’ve never made pancakes it may take a few tries to get it down, but it’s simple enough that anyone can do it. The first pancake is notorious for being the worst, which can happen do to uneven or wrong temperature or over-greasing the pan. Apparently letting the batter rest for 5–30 minutes also helps, but I don’t usually worry about that. Either serve the pancakes straight off the pan, or heat your oven to 175 F to warm plates and keep pancakes warm as you cook the rest. The batter will likely thicken over time; if it gets too thick you can thin it out with some milk. A note on pans: I didn’t make pancakes for a long time because I don’t have a proper skillet. It turns out that a regular frying pan works fine. 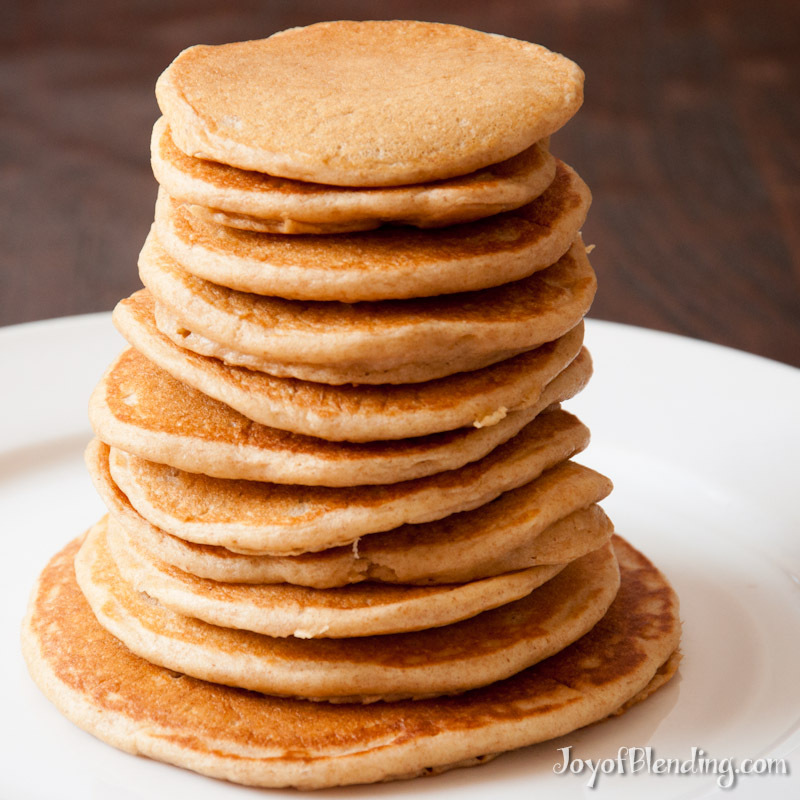 The higher sides make it slightly trickier to flip the pancakes, but it’s not a problem. I’ve now made pancakes without any problem on nonstick, stainless, and cast iron. I don’t know yet what the ultimate pancake pan is, but the point is that any old pan will work. Possible substitutions: As I mentioned earlier you can use other grains if you like. You’re shooting for about 2 cups of flour for this recipe. Grains bulk up a bit when they’re ground (~30% increase in volume). This batch ended up with slightly less than 2 cups, which actually worked out well. If you use rolled oats instead of steel-cut oats in this recipe you’d want to add about twice as much because they’re bulkier. You can make these vegan by using nut or soy milk, oil, and ground flax or chia seeds. If you have a waffle maker you can use this same batter for waffles. I’m a strong partisan for real maple syrup, ideally Grade B, which has the most flavor. These pancakes with maple syrup are delicious. It should be easy to make substitutions to this recipe. I haven’t tried making egg-free pancakes, but I would start by trying chia seeds as an egg substitute (1 Tbsp chia seeds + 3 Tbsp water per egg). Many other substitute ideas will turn up with some googling. Hi I have a Vitamix but I don’t use it much I want to get grain blade and a 32 oz container but they just cost so much I hate buying them when I don’t use it that much. Its to tall to sit on my cabinets and its a hassle getting it out of the narrow place its in. I would like to keep it out it’s the red one my kitchen has been in remodel mode for a long time maybe I’ll bring it out so I can use it more. I just found your Blog you sure know a lot about everything. Just found your site, great recipes. Tried this last week and they tasted great! But the batter was very thin and the pancakes looked closer to crepe’s as a result. Any ideas what may be making it so thin, or suggestions on how to thicken it? Did you follow the recipe exactly? Buttermilk is thicker than most other milks, so my first thought is maybe you used a different milk? In my experience, the batter thickens over time, so I’ve only ever needed to thin it, in which case I added more milk. To thicken it, I would add some flour. Next time you can try starting with less liquid, then keep adding until you get to your desired consistency. Thanks for the reply, tried again tonight and it was still pretty thin, though maybe a touch thicker (I put a touch more wheat berries). Pancakes were a bit thicker and tasted very good, so no real complaints. My wheat berries were not frozen and I used white whole grain berries, but don’t think that would matter? Will use a little less buttermilk as suggested next time and see how it goes, but even as they came out today they are very good, especially for whole wheat pancakes! You may have over blended the wet ingredients. Your batter should be slightly lumpy.